Philips Hue Lightstrip Plus | Nerd Much? Lighting is a great way to set the mood — and we don’t mean like, you know, “set the mood” in the typical sense, but more so to enhance your Netflix binge sessions. Whether you’re looking to simply add a cool glow somewhere in your home, accent your favorite painting, enhance your music listening with reactive lighting, or intensify your gaming sessions, the 2nd generation Philips Hue Lightstrip Plus has you covered. The Philips Hue Lightstrip Plus has ultimate flexibility that allows you to place it pretty much wherever you’d like, and it has adhesive tape on the back so that you can stick it to most solid surfaces. It’s also able to be cut down to a smaller size or extended with an additional strip up to 33 extra feet. 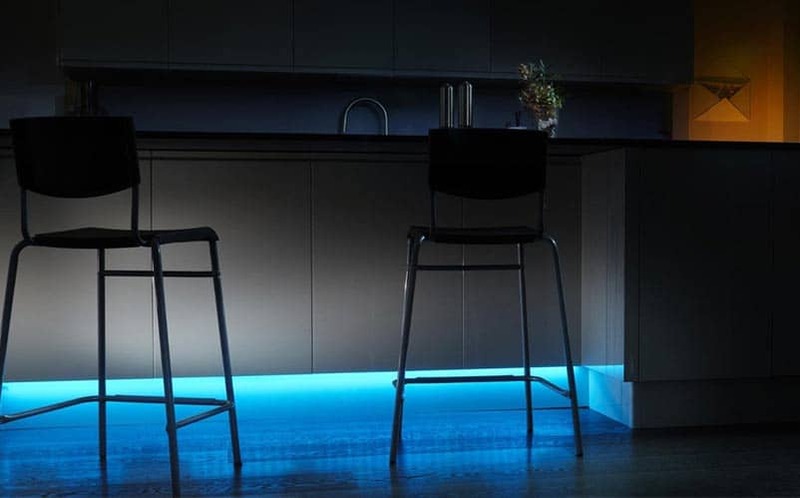 The strip of light, which outputs 1600 lumens, can be controlled through the Philips Hue app on any smartphone or tablet, and it can be controlled remotely. You can also set different lighting schedules, dim lights as necessary, set wake-up lighting, and sync with both movies and music. It’s just the latest addition to the already strong Philips Hue line of smart home lighting. Buy the Philips Hue Lightstrip Plus here. Check out more cool stuff to buy here, and stay tuned to our Twitter for new finds.